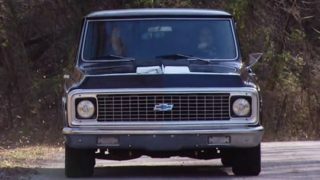 (ANNOUNCER)>> THE '67 TO '72 CHEVY PICK UP WAS SO ICONIC THAT TODAY IT'S AN EVEN HOTTER RESTO MOD. 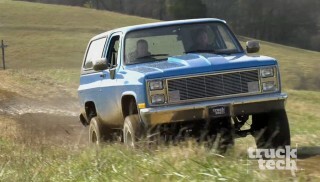 JEREMY AND LT RIP INTO THE C-10 WITH A VENGEANCE, STRIPPING HER BARE, THEN DROPPING HER DOWN. WHO'S READY TO GET DIRTY? (LT)>> WE'RE KICKING OFF A NEW PROJECT TODAY HERE AT TRUCK TECH, THIS 1971 CHEVY C-10, AND WE'RE ABOUT TO GET CRAZY WITH IT. SIGNATURE ON IT, AND IT WON'T BE A MILD BUILD EITHER. LET ME GIVE YOU THE BIG PICTURE. WE'RE BUILDING A POWERFUL, RELIABLE DAILY DRIVER THAT'S GONNA BE SLAMMED ON AIR BAGS. ACTUALLY RUNS PRETTY WELL. THE PREVIOUS OWNER ADDED A FEW NICE PARTS LIKE AN ALUMINUM INTAKE, A PAIR OF VALVE COVERS, AND A PRETTY NICE SET OF HEADERS. WELL WE'RE GOING TO BE REPLACING IT WITH THE LATEST ENGINE TECHNOLOGY AVAILABLE TO DATE, THIS DIRECT INJECTED SIX POINT TWO LITER PUSH ROD VEIGHT, ALSO KNOW AS THE LT ONE. (LT)>> AND WE GOT OURS FROM PACE PERFORMANCE. HURRY, AND THE BEST PART ABOUT DIRECT INJECTION IS THE FUEL MILEAGE. 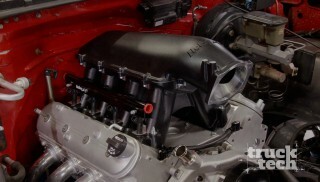 (JEREMY)>> AND THIS ENGINE IS SO NEW IT MAY BE THE FIRST TIME YOU SEE ONE GO IN AN OLD PROJECT LIKE WE HAVE HERE. 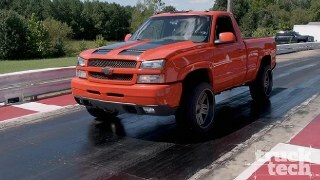 (LT)>> WELL LET'S GET THIS TRUCK TORN DOWN. (JEREMY)>> I'LL GRAB SOME TOOLS. WE'LL BEGIN UP FRONT WITH THE HOOD. A FEW BOLTS ON EACH SIDE AND WE CAN LIFT IT AWAY, FOLLOWED BY THE HOOD HINGES. (LT)>> NEXT UP IS THE GRILL. (JEREMY)>> LOOKS LIKE SOMEONE MAY HAVE NEEDED A LITTLE ROOM AT ONE POINT IN TIME. LOOKS LIKE THEY CAME IN AND TORCHED THESE FENDERS OUT, WOW. GRAB A NEW SET OF FENDERS FOR IT. (LT)>> YOU KNOW THE OTHER THING YOU CAN NOTICE ON A TRUCK LIKE THIS WHERE SOMEONE'S BEEN IN THERE AND MESSED IS THESE HEADLIGHT BUCKETS. THE HEADLIGHTS ARE ATTACHED DIRECTLY TO THE CORE SUPPORT. THEY'RE SUPPOSED TO BE A SPRING LOADED BUCKET THAT YOU CAN ACTUALLY ALIGN FOR THE HEADLIGHT. THAT'S WHY THESE LOOK SO SUNK IN. (JEREMY)>> THE WINDSHIELD WIPER ARMS HAVE TO GO TO ALLOW THE WIPER COWLING TO BE REMOVED, AFTER FREEING UP A FEW STUBBORN SCREWS. 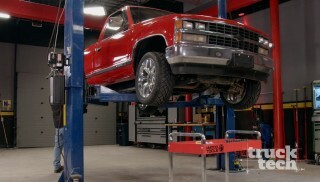 OF, YOU'LL GET YOUR FENDER ALIGNMENT SPOT ON WHEN YOU GO TO REASSEMBLE THE TRUCK LATER. AFTER REMOVING SOME OF THE BODY BOLTS HOLDING THE FENDER TO THE CORE SUPPORT WE MOVE ON TO THE BOLTS HOLDING THE FENDER WELL TO THE FENDER, BUT THEY WON'T UNSCREW. THE 45 YEAR OLD CLIPS BREAK OFF AND THE BOLTS JUST SPIN. SO JEREMY AND I WILL USE A CUTOFF WHEEL TO REMOVE THE HEADS OF THE BOLTS WITHOUT DAMAGING THE FENDERS. (JEREMY)>> THE BUMPER IS IN THE WAY OF THE FENDERS, SO IT'S REMOVED NEXT. PROJECT IS 100 PERCENT DONE. (LT)>> HERE IT COMES! 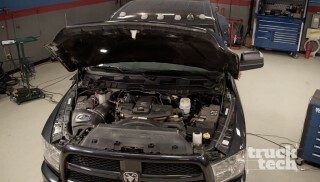 THE COOLANT IS DRAINED INTO A BUCKET BY REMOVING THE LOWER RADIATOR HOSE. YOU NEVER HAVE A BIG ENOUGH DRAIN PAN. GETTING TO THE RADIATOR IS PRETTY EASY NOW WITH THESE MATCO INFINIUM GUNS SPINNING OUT THE BOLTS IN NO TIME. THE FAN SHROUD QUICKLY FOLLOWS. THE INNER FENDERS ARE ABOUT TO GO AFTER FIGHTING WITH MORE RUSTY HARDWARE. SOMEONE ACTUALLY WELDED THE PASSENGER SIDE FENDER TO THE CORE SUPPORT. SO A CHISEL AND HAMMER ARE NEEDED TO FREE THE SHEET METAL. 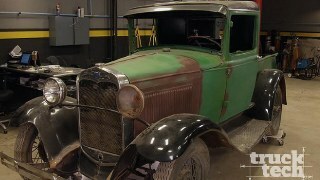 (JEREMY)>> I'D SAY WE HAVE A LITTLE RUST THERE. INNER FENDERS HAVE QUITE A LITTLE BIT OF RUST, SO WE COULD EVEN PATCH THESE BUT THEY'RE SO CHEAP FROM BROTHERS WE MAY AS WELL JUST PICK UP A COUPLE OF NEW ONES. CAN TURN OUR ATTENTION TO THE REAR AND PULL OUT THIS PLASTIC BED LINER. WELL THERE WAS A REASON WHY THAT WAS IN THERE. (JEREMY)>> WOW, LOOKS LIKE WE NEED A BED FLOOR. A LITTLE WORD TO THE WISE. WHENEVER PURCHASING A USED TRUCK THOROUGHLY LOOK UNDERNEATH A BED LINER TO SEE WHAT MAY BE HIDING. (LT)>> LOOKS LIKE WHOEVER OWNED THIS TRUCK MUST HAVE LOADED A LOT OF FIREWOOD ON THE TAILGATE OR SOMETHING. (JEREMY)>> I WOULD SAY SO, IT'S GOT A GOOD BOW IN IT. (LT)>> TO GET THE BED OFF THE TRUCK WE NEED TO WORK UNDERNEATH AND LUCKILY WE HAVE A LIFT, BUT FOR YOU GUYS AT HOME A CREEPER WORKS JUST AS WELL. BELIEVE ME, I'VE BEEN THERE. (JEREMY)>> IT'S ACTUALLY PRETTY SOLID. (LT)>> YOU KNOW WHEN I SAW THAT BED FLOOR I WAS WORRIED. (LT)>> THERE'S BEEN A FEW PATCHES HERE AND THERE. (JEREMY)>> THEY'VE PATCHED THIS BRACE, BUT IT'S NOT BAD. (LT)>> NAH, WE CAN WORK WITH IT. (JEREMY)>> ABSOLUTELY, I'VE SEEN A LOT WORSE, YEAH, OF COURSE. YEAH THE FLOORS ARE ACTUALLY REALLY SOLID, I'M IMPRESSED WITH THAT. THE FRAME LOOKS REALLY GOOD TOO. (LT)>> OH THE FRAME'S BEAUTIFUL. (JEREMY)>> I DON'T SEE ANY BENDS OR KINKS IN IT, NO PITS, I MEAN THAT'S NICE. YEAH LOOKS LIKE SOMEBODY'S PROBABLY HEATED THESE SPRINGS AT SOME POINT IN TIME TO GET THAT LOWERED STANCE. YOU CAN TELL HOW THEY'RE ALMOST FLAT. (LT)>> THAT'S THE CHEAP WAY TO DO IT RIGHT. (JEREMY)>> YEAH IT IS, YOU CAN GET IT LOW THAT WAY THAT'S FOR SURE. (LT)>> WITH A LITTLE WD 40 ON THE BED BOLTS THEY CAN BE REMOVED. (ANNOUNCER)>> NEXT MORE SURPRISED AWAIT AS THE TEAR DOWN OF THE C-10 CONTINUES. 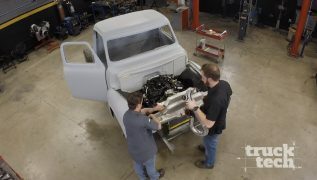 (JEREMY)>> WE'RE PART WAY THROUGH THE TEAR DOWN OF OUR C-10 PROJECT, GETTING READY TO PULL THE BED AND TAKING IT TO A BARE FRAME. (LT)>> HERE, I'VE GOT THIS, YOU JUST GET YOURS ON. AN OVERHEAD CRANE MAKES QUICK WORK OF REMOVING THE BED. (JEREMY)>> THIS ISN'T THE FIRST '71 THAT'S BEEN ON OUR SHOP. TREATED TO AN LS SWAP, A FRESHENED UP STOCK SUSPENSION, AND A DISC BRAKE CONVERSION ALONG WITH A FEW CUSTOM TOUCHES, LIKE A ONE PIECE GLASS KIT FROM BROTHERS AND SOME TRICK FAB TO RELOCATE THE FUEL DOOR. INTO A FUEL SAVING RELIABLE DAILY DRIVER THAT STILL KEPT IT'S CLASSIC GOOD LOOKS. THE HYDRAULIC HOIST. AFTER THE FRAME IS ROLLED OUT WE CAN GET A GOOD LOOK AT THE UNDER SIDE AND FRAME MOUNTS. (LT)>> BEFORE WE PULL THE ENGINE WE'LL CUT OFF THIS '90'S ERA EXHAUST, WHICH WE'LL THROW IN THE SCRAP HEAP. (JEREMY)>> IT'S JUNK AND I STILL WANT TO SAVE IT AND YOU WANT TO CUT EVERYTHING. (LT)>> I'M NOT RUINING NOTHING, THE HEADERS ARE STILL FINE. YOU WANT TO SAVE THAT RUSTY OLD TWO INCH CRIMPED EXHAUST? (JEREMY)>> I'M ONLY CUTTING THIS BECAUSE YOU CUT IT. OH YEAH MAN, WE CAN PUT THAT ON A RAT ROD. 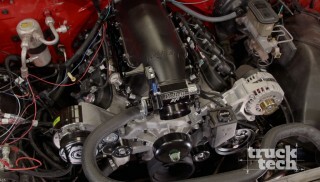 (LT)>> REMEMBER PARTS LIKE HEADERS AND THE OLD SMALL BLOCK AND TURBO 350 TRANS MAY HAVE SOME VALUE. SO WE'LL SAVE THEM FOR THE SWAP MEET. THE REST IS RECYCLED. (JEREMY)>> ONE THING I REALLY LIKE ABOUT THIS FRAME, SOMEBODY HASN'T PAINTED IT OVER, AND OVER, AND OVER AND UNDERCOATED IT. SHOULD BE PRETTY EASY TO CLEAN UP AND GET IT PAINTED. (LT)>> YEAH STILL FAIRLY FRESH FOR WHAT IT IS. 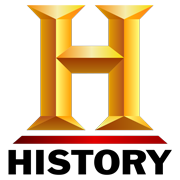 (JEREMY)>> IT'S REALLY GOOD FOR ITS AGE. (LT)>> BECAUSE OUR PROJECT INVOLVES AN ENGINE SWAP WE'RE TAKING THE TIME TO MAKE SOME DETAILED NOTES ABOUT THE ENGINE'S POSITION WITHIN THE FRAME SO OUR NEW LT ONE GOES BACK IN THE SAME GENERAL PLACE. I WANT THE BELL HOUSING FLANGE TO BE IN THE SAME LOCATION FRONT TO BACK AND THE CRANK SHAFT CENTERLINE TO BE THE SAME HEIGHT AS THE STOCK 350'S. HOPEFULLY THE NEW ONE WILL FIT IN THE SAME EXACT PLACE. NOTES ARE AN INVALUABLE RESOURCE TO REFER BACK TO LATER ON WHEN WE'RE REASSEMBLING A PROJECT. WITH THE DATA COLLECT, THE ENGINE AND TRANSMISSION LEAVE THE C-10 NEVER TO RETURN. ARM IS A QUICK WAY TO DISCONNECT THE STEERING PARTS ALL IN ONE GROUP. THE OLD SHOCKS GET RIPPED OFF AND SOME HAMMER THERAPY LOOSENS UP THE TAPER ON THE LOWER BALL JOINT. THAT'S A GREAT WAY TO LET OUT SOME AGGRESSION. (LT)>> ANYTIME YOU WORK WITH COIL SPRINGS BE VERY CAREFUL. OUR JOB WAS MADE EASIER BECAUSE IN THE PAST SOMEBODY HEATED UP THESE COILS WITH A TORCH AND THE SPRINGS DON'T HAVE AS MUCH STORED ENERGY AS USUAL. HOWEVER IF YOU DO THIS STEP IMPROPERLY YOU CAN CAUSE INJURY TO YOURSELF. (JEREMY)>> GET OUT OF HERE. THE UPPER CONTROL ARM COMES OFF WITH THE SPINDLE AND HUB ATTACHED. THE LOWER CONTROL ARMS UNBOLT ALONG WITH THE MOTOR MOUNTS. I CANNOT STRESS ENOUGH HOW IMPORTANT IT IS TO BAG AND TAG EVERY SINGLE THING YOU TAKE OFF. JUST LIKE THESE MOTOR MOUNTS, EVEN IF WE KNOW WE'RE NOT GONNA USE THEM AGAIN OR THE HARDWARE IT'S GOOD JUST TO GO BACK AND HAVE THIS STUFF TO REFERENCE TO LATER ON. (LT)>> A GOOD TIP IS TO MARK EVERYTHING YOU WANT TO GET RID OF WITH A PAINT MARKER. THERE ARE SEVERAL TABS AND BRACKETS WE'LL BE GETTING RID OF, AND THE PAINT MAKES IT EASIER TO REMEMBER WHAT PARTS NEED TO GO ONCE YOU'RE IN DEMOLITION MODE. (JEREMY)>> TOWARD THE REAR OF THE TRUCK THE SHOCKS AND UBOLTS ARE REMOVED, AS WELL AS THE PAN HARD BAR. NOW WE CAN LIFT OUT THE STOCK AXLE. TO MAKE REMOVAL EASIER WE CUT THE COIL SPRINGS AND DROPPED THE TRAILING ARMS. WITH THE SPRING GONE WE CAN EASILY GET TO THE BOLTS HOLDING THE SPRING MOUNT TO THE FRAME. (LT)>> THE TRAILING ARM CROSS MEMBER IS RIVETED IN, AND OUR TRIED AND TRUE METHOD MAKES FAST WORK OF THOSE STUBBORN THINGS. JUST MAKE SURE TO WEAR PROPER SAFETY EQUIPMENT. (LT)>> YEAH. THIS CUSTOM HITCH WAS AN ACCIDENT WAITING TO HAPPEN, SO IT GOES AWAY FOR GOOD. (JEREMY)>> AND NOW THE REAL FUN BEGINS. (LT)>> WHO'S IDEA WAS THIS? (JEREMY)> USING A VARIETY OF POWER WIRE BRUSHES AND SANDERS WE CLEANED UP THIS 1971 FRAME TO PREPARE IT FOR PAINT. WE RAN INTO RUST, GREASE, AND GRIME, BUT A FEW HOURS LATER THE FRAME IS LOOKING SO MUCH BETTER. (LT)>> UNFORTUNATELY WE CAN'T SAY THE SAME THING ABOUT US. (JEREMY)>> I HAD FUN TODAY. I DON'T THINK LT HAD VERY MUCH FUN. DID YOU ENJOY THIS? (LT)>> I DON'T KNOW, HALF WAY. (JEREMY)>> PART OF BUILDING A HOT ROD MAN. (ANNOUNCER)>> AHEAD THE GOODS THAT'LL PUT THE DROP ON THIS CLASSIC TRUCK. (LT)>> WE'RE MOVING OUR RESTO MOD '55 F-100 OUT OF THE WAY TO MAKE ROOM FOR OUR C-10 IN THE PREP BOOTH. IT'S MORE OF A REAL WORLD BUILD. (JEREMY)>> YEAH, SOMETHING LIKE YOU GUYS WOULD DO IN YOUR OWN GARAGES. SO FOR THE FRAME IT'S GETTING A RATTLE CAN TREATMENT. (LT)>> FIRST WE'LL DEGREASE THE ENTIRE SURFACE, REMOVING ANY DEBRIS, DUST, OR METAL PARTICLES FROM OUR WIRE BRUSHING. COMES IN AEROSOL CANS. NOW I'VE BEEN USING THIS PRODUCT FOR YEARS AND TRUST ME WHEN I TELL YOU IT REALLY WORKS. JUST POUR A LITTLE BIT INTO A MIXING CUP AND BRUSH ON A THIN LAYER. NOW YOU DON'T NEED MUCH AND YOU CAN JUST GO OVER THE RUST AREAS. ONCE IT STARTS TURNING BLACK THAT'S HOW YOU KNOW IT'S WORKING. AFTER THE RUST CONVERTER IS CURED, A LITTLE AIR WILL BLOW ANY DUST AND DIRT AWAY FROM THE FRAME. THIS IS A GOOD TIME TO WIPE EVERYTHING DOWN WITH SOME WAX AND GREASE REMOVER. THIS WILL GET RID OF ANY REMAINING OILS THAT WOULD PREVENT THE PAINT FROM STICKING PROPERLY. (JEREMY)>> FOR OUR SUSPENSION WE WENT TO BROTHERS TRUCKS DOT COM AND PICKED UP ONE OF THEIR AIR SUSPENSION KITS THAT COMES WITH EVERYTHING WE NEED FOR INSTALLATION. BAGS OR ALL FOUR CORNERS, BAG MOUNTING BRACKETS, SHOCK RELOCATING BRACKETS, AND OF COURSE ALL FOUR SHOCKS. NOW THIS IS A TRUE BOLT IN KIT THAT JUST REQUIRES A LITTLE BIT OF DRILLING, AND WITH THAT ALONE, AT RIDE HEIGHT YOU'LL HAVE ABOUT A THREE TO FOUR INCH DROP AND FULLY DEFLATED CLOSE TO SEVEN OR EIGHT INCHES. NOW THAT MAY BE ALL THE DROP YOU'RE AFTER BUT WITH OUR C-10 WE WANT TO GET IT AS LOW TO THE GROUND AS WE CAN. SO WE'RE ALSO ADDING A SET OF TWO INCH DROP SPINDLES UP FRONT, OUT BACK A PAIR OF THEIR HEAVY DUTY TRAILING ARMS WITH INCH AND A HALF LOWER BLOCKS, AND A BOLT IN CNOTCH TO GIVE OUR AXLE ROOM TO TRAVEL. WE'LL GET STARTED BY INSTALLING THIS CROSS MEMBER. ...AND BOLT THE CROSS MEMBER IN PLACE. THEN BOLT ON THE TRAILING ARM BRACKETS. (LT)>> WE HAVE TO CUT A NOTCH IN THE FRAME TO ALLOW THE AXLE TO GO AS LOW AS POSSIBLE. SO WE'LL CLAMP THE UPPER REENFORCEMENT INTO PLACE AND DRILL THE MOUNTING HOLES. THIS WILL SERVE AS A TEMPLATE TO MARK WHERE THE FRAME NEEDS TO BE REMOVED. ONCE THE REENFORCEMENT IS OUT OF THE WAY A CUTOFF WHEEL MAKES QUICK WORK OF THE NOTCH. WHILE TAKING A CHUNK OUT OF THE FRAME DOES MAKE IT WEAKER, THE REENFORCEMENT PLATES WILL MORE THAN MAKE UP FOR THE MISSING FRAME. HIT THE BARE METAL WITH SOME PAINT TO PREVENT RUSTING, AND WHEN IT'S DRY BOLT IN THE UPPER AND LOWER REENFORCEMENTS. NEXT THE TRAILING ARMS CAN ATTACH. WANT TO BE AS LOW AS WE CAN. (LT)>> I'LL TELL YOU WHAT, AFTER ALL THAT CUTTING, AND GRINDING, AND WELDING, THE REST OF THIS SHOULD BOLT ON PRETTY QUICK AND EASY. (JEREMY)>> YEAH THIS SHOULD BE PRETTY STRAIGHT FORWARD NOW. THE CONTROL ARM, AND THEN TO THE FRAME OF THE TRUCK. THE STOCK REAR AXLE HAS BEEN PAINTED AND GOES BACK INTO PLACE. ARE GONNA COME BACK AND ADD A POSI AND SOME BRAKES LATER ON. RIGHT NOW THOUGH LOWERING BLOCKS CAN GO BETWEEN THE AXLE AND THE TRAILING ARM, FOLLOWED BY THE UBOLTS AND THE SUPPLIED LOWER SHOCK MOUNT THAT SANDWICHES IN BETWEEN THE BOLTS. (JEREMY)>> THE SHOCKS ARE NEXT AND TO FINISH UP THE REAR WE'LL INSTALL THE PAN HARD BAR TO KEEP THE AXLE CENTERED. 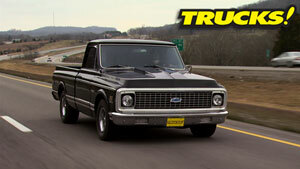 (JEREMY)>> TO GET THE FRONT OF OUR C-10 BAGGED LT WILL PREP THE LOWER CONTROL ARMS TO ACCEPT THE NEW SUSPENSION. (LT)>> THE CONTROL ARMS, SPINDLES, AND MANY OF THE BRACKETS IN THIS KIT ARE BARE STEEL AND MUST BE PAINTED BEFORE THEY GO ON. SO NOW IS A GREAT TIME TO DO IT. AFTER LUNCH AND THE PAINT DRIES, NEW LOWER BALL JOINTS GET PRESSED IN WITH OUR HYDRAULIC PRESS, AND THE UPPER BALL JOINTS BOLT ONTO OUR NEW TUBULAR CONTROL ARMS. ONTO THE FRAME AFTER A FEW MORE THREEEIGHTHS INCH HOLES ARE DRILLED. THE SUPPLIED SHOCKS FINISH UP THE FRONT SUSPENSION AND WILL GET OUR TRUCK RIDING ON AIR. WE'RE GONNA FRESHEN UP THE STEERING SYSTEM ON OUR CLASSIC C-10 WITH THESE NEW MOOG PARTS FROM ROCK AUTO DOT COM. WE PICKED UP A SET OF THEIR INNER AND OUTER TIE ROD ENDS AS WELL AS NEW THREADED ADJUSTMENT SLEEVES. WE ELECTED FOR THE UPGRADED IDLER ARM AND PITMAN ARM, AND WE ALSO PICKED UP A REMANUFACTURED MANUAL STEERING GEAR BOX. TOGETHER ALL THESE PARTS ARE GONNA GIVE OUR CLASSIC C-10 DIRECT AND PRECISE STEERING CONTROL. THREE BOLTS HOLD OUR NEW STEERING BOX TO THE FRAME. NEXT THE IDLER ARM ATTACHES, FOLLOWED BY OUR TRUCK'S ORIGINAL CENTER LINK. AFTER THE TIE ROD ASSEMBLIES GO INTO PLACE THE STEERING IS COMPLETE. (JEREMY)>> BROTHERS RECOMMENDS THE USE OF SWAY BARS WHEN CONVERTING TO AIR SUSPENSION. SO WE HAD THEM SEND US A FRONT AND REAR SWAY BAR KIT. IT USES POLY URETHANE BUSHINGS AND INCLUDES THE HARDWARE AND BRACKETS YOU NEED FOR INSTALLATION. NOW THIS WILL DEFINITELY COMPLIMENT OUR LOWERED SUSPENSION BY REDUCING BODY ROLL AND IMPROVING HANDLING. INSTALLING THESE SHORTER ONES. THE FRAME BRACKETS INSTALL USING FACTORY HOLES, AND ONCE THE BUSHINGS ARE GREASED THEY SLIP OVER THE SWAY BAR. WITH A LITTLE HELP, THE SWAY BAR CAN BE ATTACHED TO THE FRAME MOUNTS AND BOLTED UP. (LT)>> WE'LL GET THE TRUCK ON THE GROUND AND TEMPORARILY INSTALL OUR AIR SYSTEM BY MAKING CONNECTIONS AT THE TANK AND ALL FOUR CORNERS OF THE BAGS. OUR C-10 THIS WEEK. WE'VE GOT IT LAYING ON THE GROUND WITH AIR, AND WITH IT PUMPED UP ALL THE WAY WE ACTUALLY HAVE A PRETTY DECENT RIDE HEIGHT. 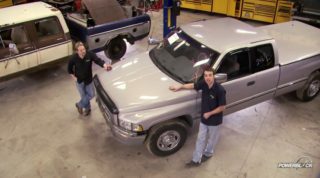 (JEREMY)>> YEAH MAN I LOVE THIS AIR RIDE, AND NEXT TIME YOU GUYS SEE THIS TRUCK WE'RE GONNA DO A LITTLE BIT OF RUST REPAIR, FINISH PLUMBING THIS CHASSIS, AND HOPEFULLY STICK THAT NEW LT ONE IN BETWEEN THESE FRAME RAILS. THAT'S COOL! (LT)>> A LOT OF WORK, IT'S COOL THOUGH.